Hello! Thanks for visiting today for Just-A-Scrappin' 9-11-2014 Challenge Coloring with Markers - Copic, Spectrum Noir, Tim Holtz etc. Make a cards, layouts, 3D projects or altered art. All embellishments, paper and card stock is from my stash so I do not have all the names of the companies. 1. I started with white card stock and Clearly Gina K. The Northwoods stamps. 2. I'm using mixed markers - Bic Mark It, Zig Millennium and Sharpie to color the trees and the deer. 3. I added the Comfort-craft Tools Chalk Edgers for the snow. 4. 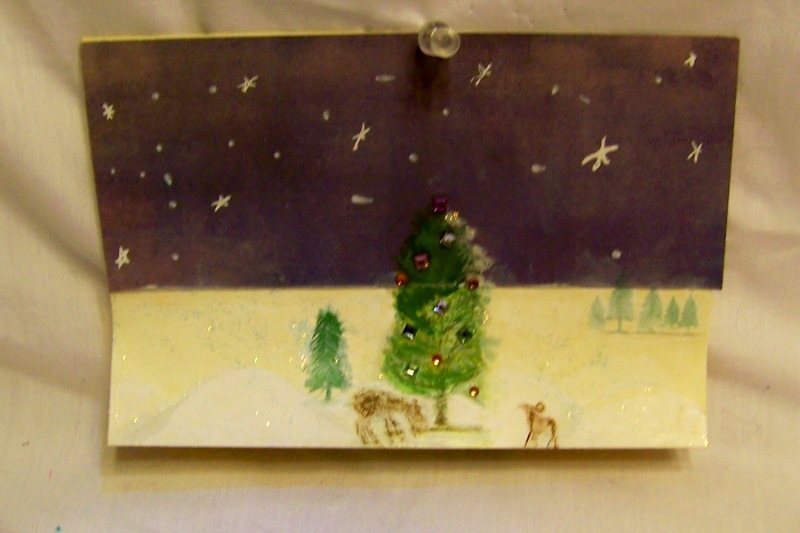 Then I adhered with TomBow permanent adhesive onto the card base the night sky and with white gel pen put in the stars. 5. Last added the white colored card stock to the bottom half of the card base then added Star Dust Stickles for the snow to sparkle. I plan on using this for Cards for Hospitalized Kids it can be used for a winter Birthday or what every they need. I'll be submitting this to Pumpkin Spice Challenge #82 - Birthday, September ODBD at OWH. What a nice winter scenes-I'm sure your organization will put it to good use!